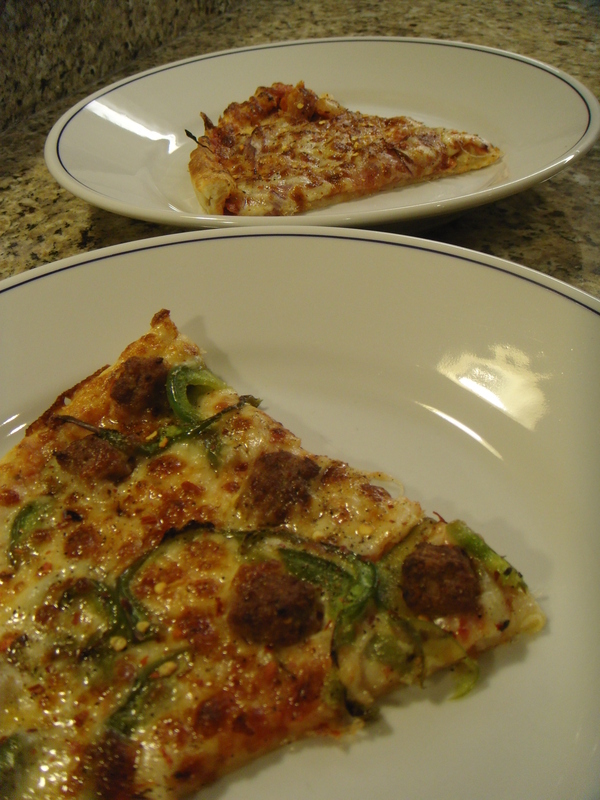 Sausage/green pepper and Canadian bacon/onion. I don’t know when it started — in Chicago, probably — but somewhere along the line, we adopted the oh-so-original tradition of Friday night pizza. We have made it our quest, wherever we go, to find the best delivery joint: the crust must be thin, crisp, oven-browned; the salads must be big (nothing worse than paying $10 for a paltry tin of dying lettuce and dead shaved carrots). The quest continues in Portland, but our current favorite is Bandini. I confess to being a skeptic when we first walked by the restaurant on MLK. The place looks cozy and inviting enough, but the menu seems scattershot: appetizers, pastas, salads, sandwiches, desserts and, of course, pizza. A real red-sauce, family-style, kid-in-booster-seats kind of place. But we took the leap and ordered delivery one Friday night last November, and it’s been our go-to Friday-night date ever since. Ordering can be tricky, especially if you are trying to communicate the concept of “easy cheese” or even “light cheese” to the sweet, non-native English-speaker on the phone — but who cares? The pizza arrives lickety-split, and the delivery guy is courteous and friendly. Friday night pizza is a staple at the Molema house too. Cheers to the kindhearted pizza delivery guy! Hey Julia: What’s the largest pizza you’ve seen?